They say your email inbox is a terrible place to manage tasks. I’d disagree. I think it’s the perfect place. After all, most of my tasks come in via email, and any app that can share information can share it via email. Why bother dickering with an extra app, keeping all that important stuff in two places, when it can all be easily managed in one spot? I’ve been doing exactly this ever since I ditched OmniFocus, which is so long ago I can’t remember how long ago it was. With a little bit of setup in your everyday news and browsing apps, you can turn your inbox into a proper universal task list. Here’s how. This tutorial will use your email account, Mr. Reader (for RSS news items), Twitterrific and Drafts, plus one simple mail rule to organize things behind the scenes. You can gussy things up with all kinds of extras, but the core system is both solid and flexible. Like I say, I’ve been using it for months and it’s way better than anything else I’ve tried. Email is ubiquitous, so it’s the perfect place to keep your task list. If you make use of lots of separate projects, or have specific needs for metadata and GTD contexts, then maybe you should stick with something like OmniFocus or Things. But you’d be surprised just how far my mail-based system can stretch. First, it might be worth describing the kinds of things I save. I write about hardware, gadgets and apps, so my work mailbox is the place for anything I’d like to write a post about. These can come from regular emails, or from RSS, or from Twitter or anywhere else. I even have a Drafts action that will mail notes straight to this address so I can send myself reminders about things I find in the real world. I use Fastmail. The company is Australian and therefore out of the jurisdictional reach of the National Security Agency and its spooks, but the main reason is that it’s The Best. The webmail interface is better than many native apps (I use the webmail 95 percent of the time on iOS — that’s how good it is). Plus it’s quick. You lose nice things like Gmail tags and IFTTT integration, but it’s worth it. Fastmail beats Gmail hands down. 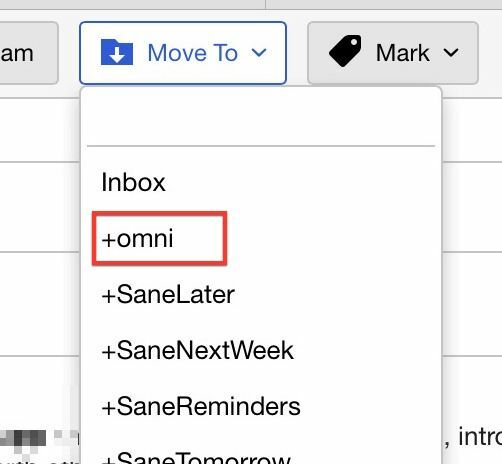 This takes any email sent to my Omni address (anything will do here, as long as it’s different from your usual plain email address) and files it into the Omni folder, skipping the inbox. This is pretty much the entire setup. I also have (confusingly) another rule called “To-do,” which I use for non-work-related reminders. You could make as many of these as you’d like, filtering different mails into different places. But that’s so complex you might be better of with a task-manager app. One note: This is best done on the server side. That is, the rules are run by your mail service on its own servers, and the filing is done before you ever see it. 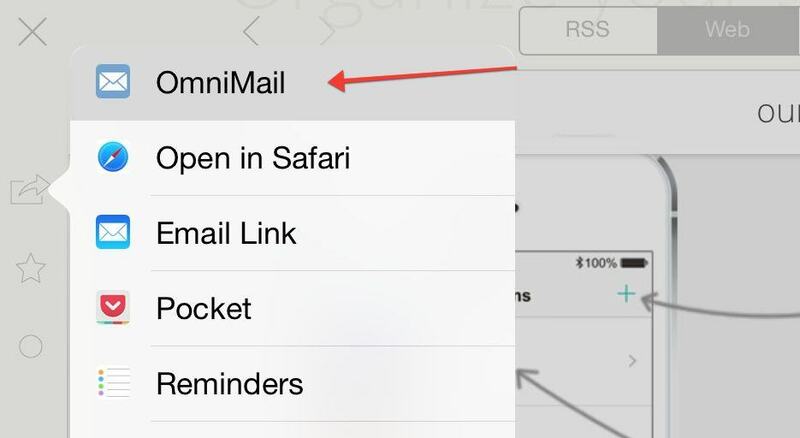 You could use mail rules in the Mail app, but they’ll only run when your Mac is switched on. Server-side rules let you use this whole system on an iPhone, no Mac required. When I’m checking my regular incoming mail, I can just add the relevant messages to the Omni mailbox. 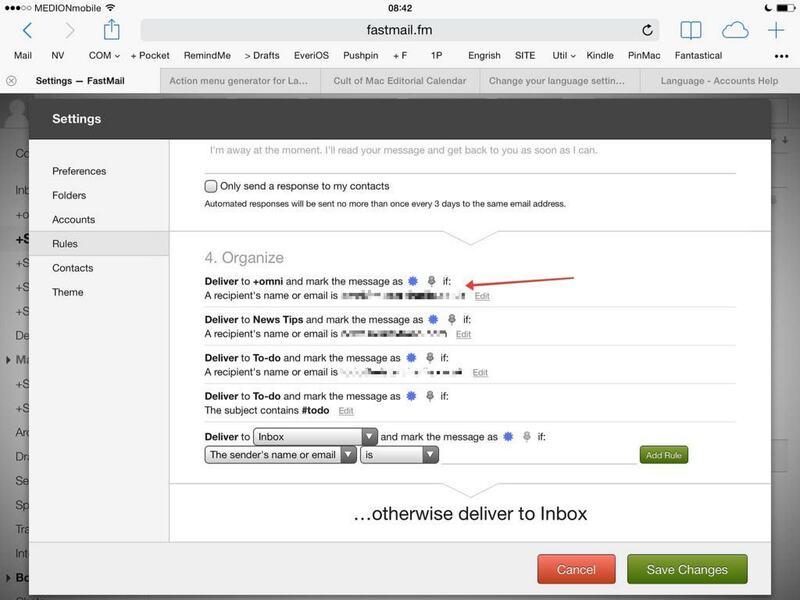 In Mac OS X Mail, you can use keyboard shortcuts to do this, but I do it in Fastmail’s web interface on my iPad, mostly because it’s so fast and easy. Mr. Reader is my RSS feed reader of choice for two reasons. First, it’s fast and just great to use. Second, you can add all kinds of custom actions. You can send articles to Pocket or other apps on your iPad, but the thing I use it for is – you guessed it – email. I have a custom action set up that lets me mail a whole article off in three taps – one to open the sharing menu, one to choose the Omni service, and one to send the resulting mail. That’s pretty easy. This is the rule, which you can also install from here. This is the code that you need to put in the action. 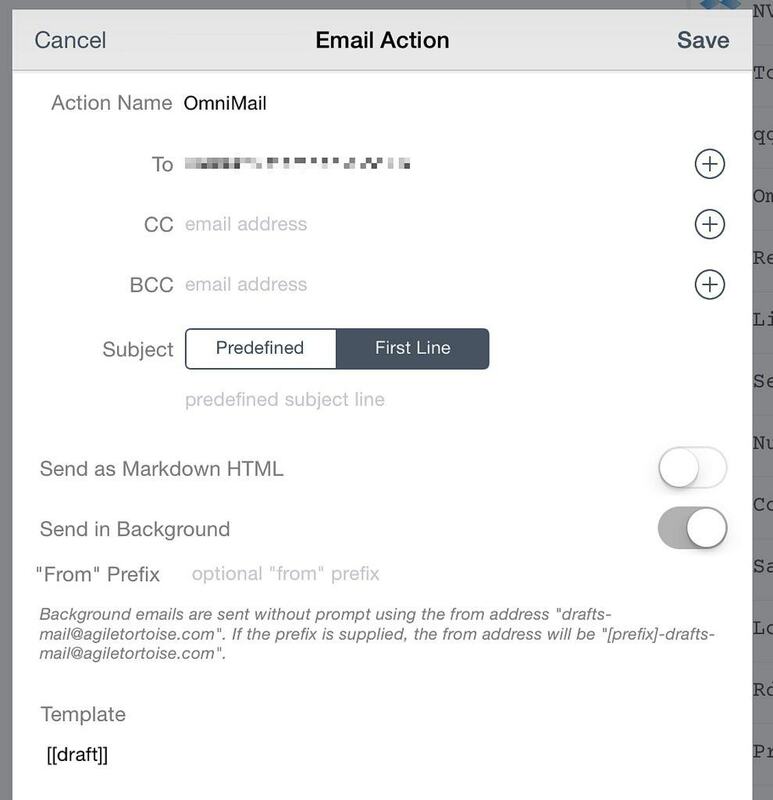 Make sure you also set it to be sent as an HTML mail so it’ll show up nice in your mail client. I have the source URL in there, too, so I can quickly copy the link for proper attribution in posts. You can tweak this as you like. With this action, I can quickly send any article, in full fancy HTML so it looks just like the RSS entry, to my Omni inbox, ready to write up later. Twitter integration is an example for the “everything else” category. That is, you just email the tweets to your special address and your mail rule takes care of filing. There’s not much to this part, other than that it’s easier if you have the email address in your address book. But if you just tap it in manually a few times, iOS will remember it for you. 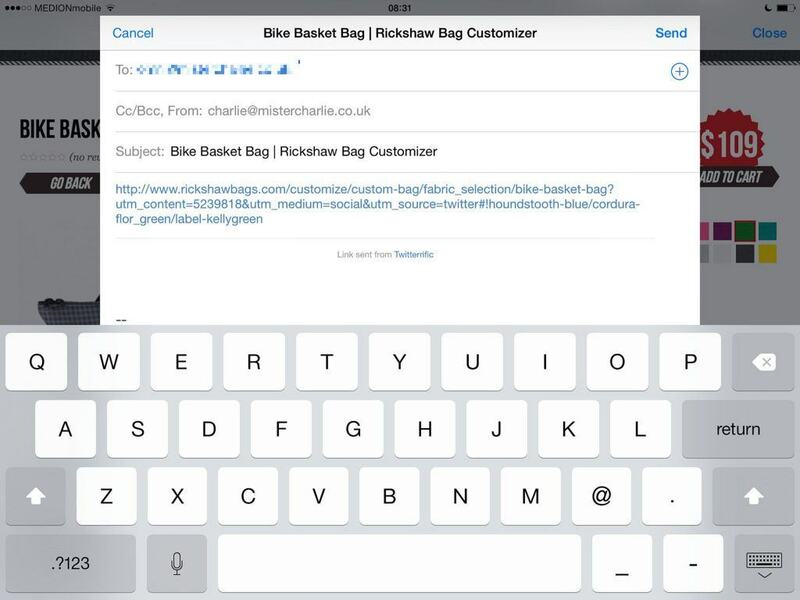 It might also be a smart trick to add your email address as a keyboard shortcut in the iOS settings, so you can simply type a few letters and have it expand the whole thing wherever you are on your iPad or iPhone. 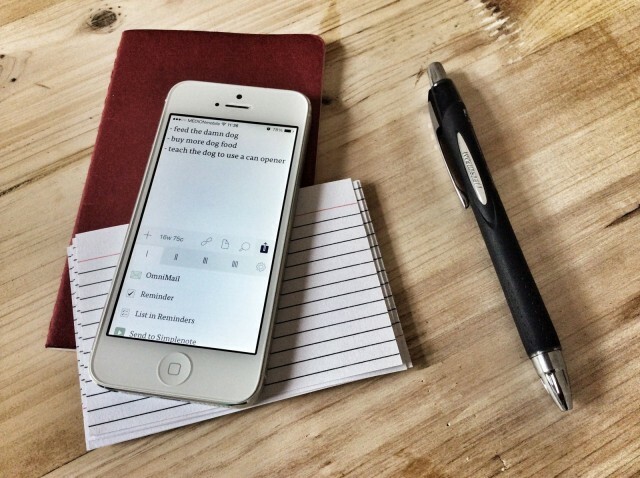 Drafts does so much, letting you take text from almost anywhere and send it to almost anywhere else. In this case I’m using it for one simple thing: to send a quick mail to my Omni mailbox address. The subject line can be preset, but I just have it as the first line of the body text. I also choose to have the email sent in the background, which uses a mail server built into the app and means I don’t need to deal with a popover mail sheet and hit send for every message. This would be a great feature for Mr. Reader, too. I can’t help you with this part. You just need to make sure you check your special mailbox often enough to make it useful. I live out of my Omni mailbox, spending more time there than in my inbox. But that other to-do mailbox I mentioned? I hardly ever look in there. In this regard, my method is much like any other to-do system — you have to actually stay on top of it. But in every other regard it’s better, for me at least. It’s there in every mail app I ever use, and every web browser. 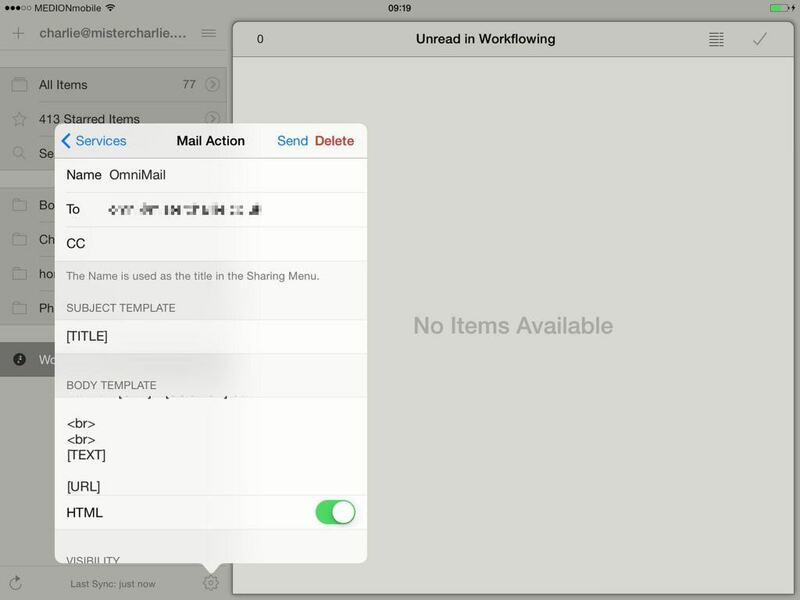 It’s fast, and I never have to worry about whether I have the task in my email or my task-manager app. In fact, there’s almost no maintenance at all. You just save tasks, then act on them. Ironically, since I just changed the focus of my job here at CoM to write more features, I’m going to need a way to work with projects. Creating new folders for each project is easy enough in Fastmail (and even easier in Gmail with labels), but the auto-filing will need special rules for each new project, which is a pain to manage. If you have any ideas, hit me up on Twitter. Likewise, that’s the best place for feedback in general.